Winnipeggers are known to handle cold weather as well as anyone. On January 13th, a group of Winnipeg newcomers caught on to that mentality as they braved the -20 C-plus-wind-chill weather for a day of winter activities at Camp Manitou. The event, Welcome to Winnipeg, was hosted by the True North Youth Foundation (TNYF), and brought 60 Canadian newcomers from countries as far away as Syria, Afghanistan, and India, to Camp Manitou to experience the great game of hockey and have the opportunity to skate for the first time. 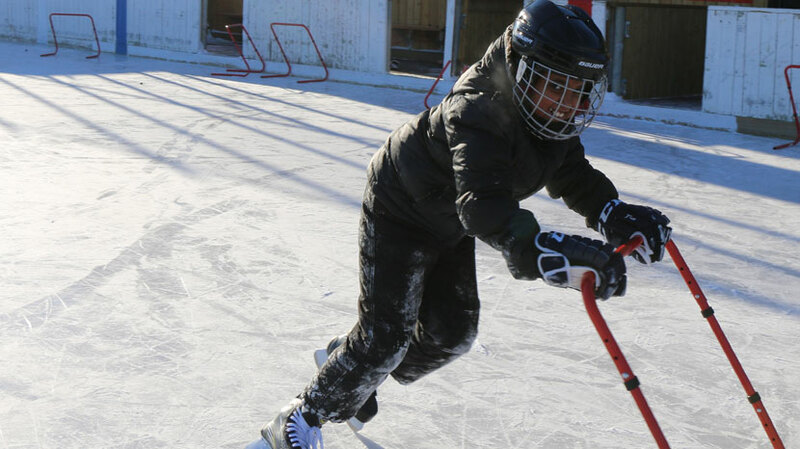 “The vast majority of people had not skated before, so we used many of our EZ Skater devices to assist them with balance,” said Camp Manitou Director, Rick Bochinski. The idea for the event was sparked by a grant that the TNYF received from the NHL and NHL Players Association (NHLPA) to introduce new Canadians to the sport of hockey. The TNYF connected with several groups in Winnipeg that help newcomers get settled in the city, including the Immigrant and Refugee Community Organization of Manitoba (IRCOM) and the Seven Oaks Neighbourhood Settlement, to make the event happen. Even though frigid temperatures are a new reality for many of the newcomers, Bochinski said the group came dressed for the weather and were ready to snowshoe, cross-country ski, and toboggan. Indoor floorball offered a chance to warm up, as did activities and hot chocolate inside the camp’s main lodge. In addition to the opportunity to skate, all participants received tickets to an upcoming Jets game, and a $25 Jets Gear gift card. Following the inaugural event, Camp Manitou hosted two additional Welcome to Winnipeg sessions this winter. All in all, around 120 new Winnipeggers were introduced to the fun of winter sports and the True North Youth Foundation looks forward to continuing the program next year.